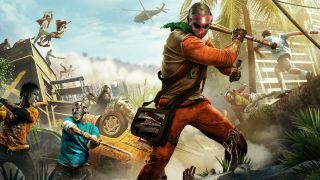 Dying Light: Bad Blood will be free-to-play when it eventually launches, giving players the chance to hone their battle royale-ish skills in the zombie infested world of Dying Light. But if you can't wait, or like the sound of extra perks, consider throwing down $19.99 for the Founder's Pack, which gets you a bunch of items and means you can play the game today. The $19.99 Founder’s Pack will buy you in-game currency, exclusive items, and a Founder’s Pass that will get you three Legendary skins over a three-month period. That's all in addition to the free content updates that will add new items, characters, and maps to the undead action. "We’re really happy with the results of our recent Global Play Test and I’d like to thank all of the players out there that took part and gave us such helpful insight," says producer Maciej Łączny. “We’ve made some big leaps in development based on that activity and look forward to the road ahead as we prepare new content for the game, the first of which will be available in the next few weeks." Dying Light: Bad Blood will eventually adopt a free-to-play model on PC, and Xbox One. See more of 2018's most anticipated titles in our comprehensive list of the new games of 2018.